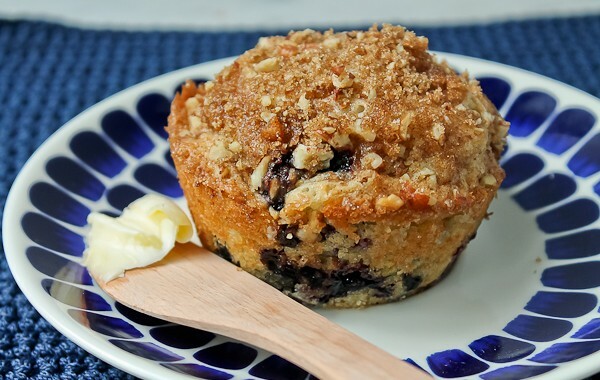 Muffins have been edged out by doughnuts and cronuts, but I still love a good fruity muffin for breakfast now and then, usually blueberry or raspberry. 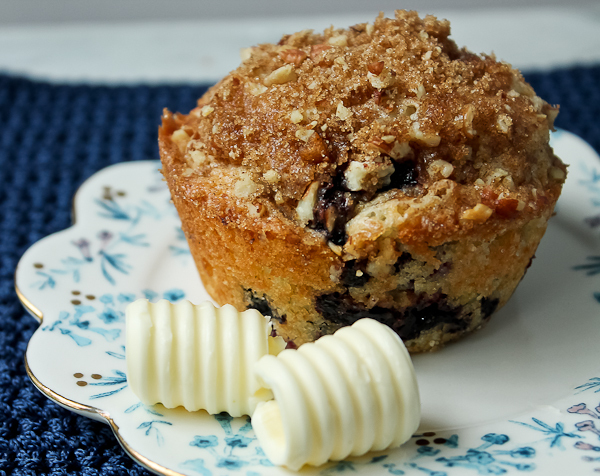 My husband loves muffins, especially the jumbo size ones and this recipe just happens to make six of the large size muffins. Since I hadn’t made the jumbo size in a long time, it was his lucky day. I also decided to use the wooden butter knife I bought in Finland this summer, plus the blueberry tea towel I bought there too. Adorable, right? Then I decided to play with the butter and found my old butter curler. And another plate. Sigh… I am such a sucker for plates, napkins, utensils, gadgets, dishes, etc. 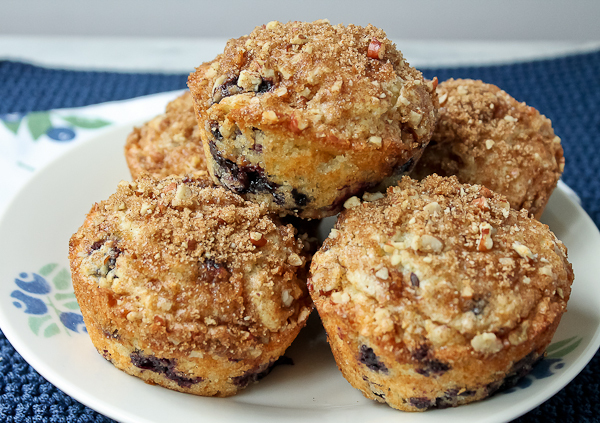 I’ll stop here and just give you the recipe for these really good little muffins. Or rather, these big muffins. Heat oven to 350 degrees F. Generously grease 6 jumbo size muffin pans; set aside. In bowl of electric mixer, cream butter and sugar until light and fluffy. Beat in egg, milk, and lemon peel. Stir in flour, baking powder, and salt just until blended. (Batter will be lumpy) Fold in blueberries just until mixed in. Spoon evenly into prepared muffin pan. For topping: In a small bowl, mix together streusel topping ingredients until well blended. Sprinkle evenly over the top of the 6 muffins. Bake muffins for 23-26 minutes or until a tester inserted in the middle of a muffin comes out clean. Remove from oven and let muffin tin rest on a wire rack for 5 minutes. Run a knife around the edge of each muffin and remove from tin to wire rack. 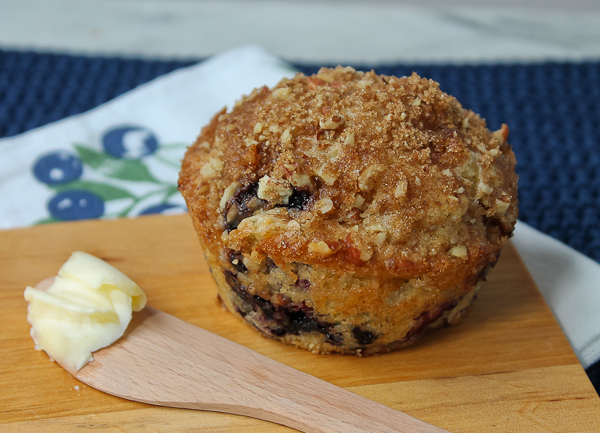 Serve muffins warm with lots of butter! I too love cookbooks and muffins. I understand where you are coming from. It is cozy to grab a cookbook and read it like a novel. They are not only filled with recipes but love and interesting stories and tips. Now, all we need do is eat one of these muffins while reading and perfection has come our way.